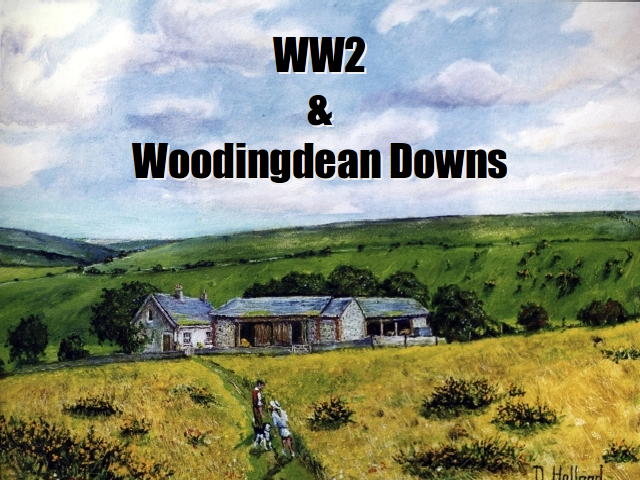 WW2 & Woodingdean Downs; painting by Douglas Holland. Last month I gave a talk as part of the Woodingdean V.E. day commemorations. It was about the demise of Newmarket Farm and the Balsdean downs east of Woodingdean (a village near Brighton), 1938 – 1945. Unfortunately I was so busy (and anxious) researching the talk I didn’t get around to telling many people about it. I always do far more research than I can fit into a talk. I could easily have spoken for an hour or two, but my time slot was for just 20-30 minutes. Fortunately I managed to finish preparing it in time, and it seemed to get a good reception. I have since been asked to give a summary here so that others who couldn’t make it might read something of what I presented. 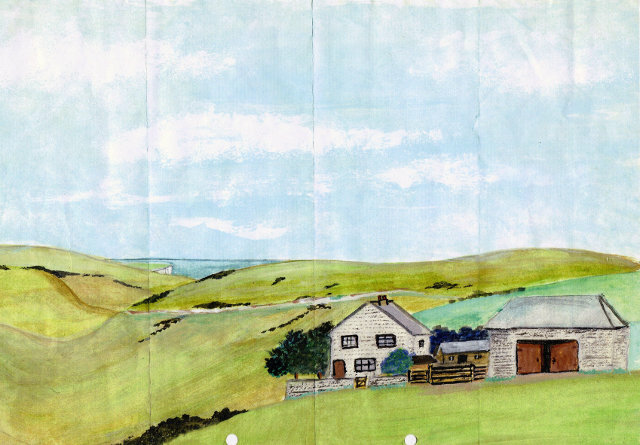 The opening slide was of a painting of Newmarket Farm – birth place of my mother Peggy in April 1942 – painted by her uncle Douglas Holland, based on his vague memories of teenage visits. 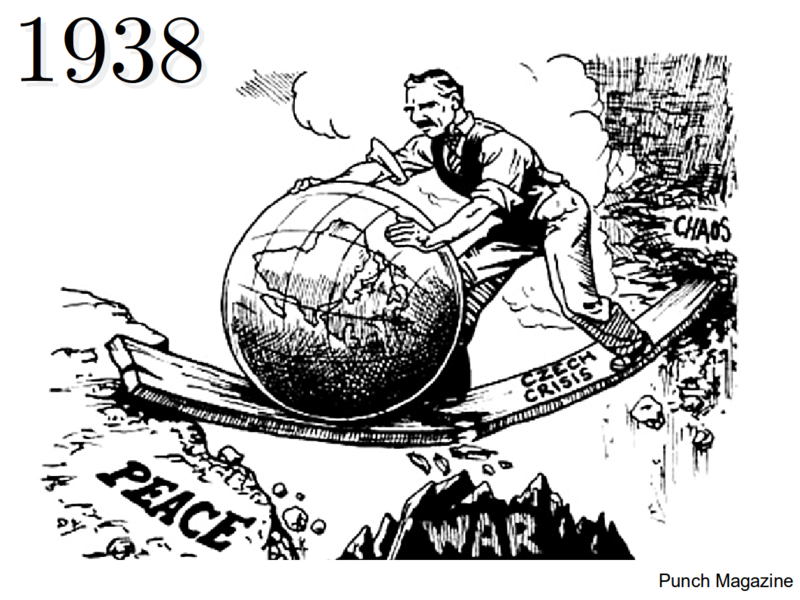 Punch Cartoon 1938, Chamberlain & World Crisis. Phipps family children; Desmond (Bob), Lucy, Sylvia. Watercolour of Newmarket Farm, painted from memory by Desmond (Bob) Phipps, in about 2010. I have written more about their lives, and the farmer who they worked for, in a draft copy of the Newmarket Farm book linked to at the top of this webpage. The picture shown above was painted from memory by Bob Phipps and he put it on display at the Woodingdean Then and Now history event. He wrote a request for any information on the history of the farm. Peggy recognised the painting as resembling her uncle’s painting and the two families were immediately introduced to each other. I was asked by them if I would be willing to research the Newmarket Farm’s history and the rest is, er…, history! 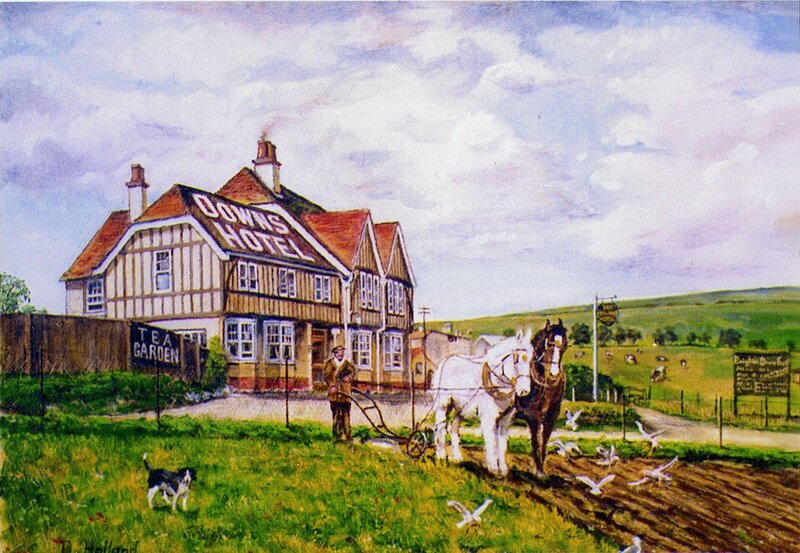 One of the first things the three Phipps ‘children’ asked Peggy was “how come your dad got our dad’s job?” I discovered from them that their father, Edward Phipps, worked with horses – like the ploughman in Douglas Holland’s painting in front of the nearby Downs Hotel in Woodingdean. Landgirl during Second World War disk harrowing. Photograph probably taken at Woodingdean[?] by Brighton Parks & Gardens Dept. Image from The Royal Pavilion and Museums, Brighton & Hove. The Woodingdean historian Peter Mercer, for his book ‘The Hunns Mere Pit’, recorded an interview with the farmer’s son of this time, Mr Gerald Woodman. Part of that recording was played to the audience immediately before my talk. Mr Woodman told how, before the war, his father bought two Fordson tractors to meet the demands of the War Agriculture Committee. Some family history research, by one of Peggy’s relatives, revealed that her parent’s marriage certificate recorded her old man, Reginald Latham’s stated occupation as tractor driver. So in all likelihood the Phippses were replaced by the Lathams because horses were replaced by tractors. Latham family shortly after the war, Peggy at front. However, Mr Woodman’s memories didn’t entirely make sense. My studies of WW2 agriculture all indicated that the War Ag Committees didn’t start dictating to farmers how much of their grassland to plough till after the start of the war. I learned that, except for a few short years during and shortly after WW1, there was very little money to be made from farming in the inter-war years. It was cheaper to import food than to grow it. However, this made us vulnerable to a naval blockade. This was something that looked increasingly possible as the 1930’s progressed. Therefore in 1937 the government encouraged farmers to plough up their permanent pastures and grow more cereals, which could be stockpiled in case of an emergency. This was done by means of guaranteed prices and discounted fertilizers. On the 3rd of September 1939 Mr Neville Chamberlain declared to the nation that Britain was at war with Germany. Balsdean Hamlet. (Photo: Part of the Holland – Mercer collection). The Georgian farm house of Balsdean. (Photo: James Gray Collection, Regency Society). Norman chapel, used as a cow shed. (Photo: Part of the Holland – Mercer collection). The (de-consecrated) Balsdean Chapel, and labourer’s cottages, and part of the former Norton Farm in the background. Balsdean was an isolated but beautiful downland hamlet, all that remained of a larger medieval settlement. As early as 1937 the Phipps family recall soldiers on training exercises over these hills. By 1941 one of the two farmers wrote a letter to Brighton Corporation, their landlord, complaining of the number of soldiers interfering with the running of their farm. However, both farmers signed up to serve with the Home Guard. Mr Arthur W. H. Dalgety, who was also Master of the Southdown Hunt, rode with the Lewes mounted Home Guard, otherwise known as the Lewes Cossacks. For my talk I showed this British Movietone News clip which featured two former Grand National winning jockeys who were also members. 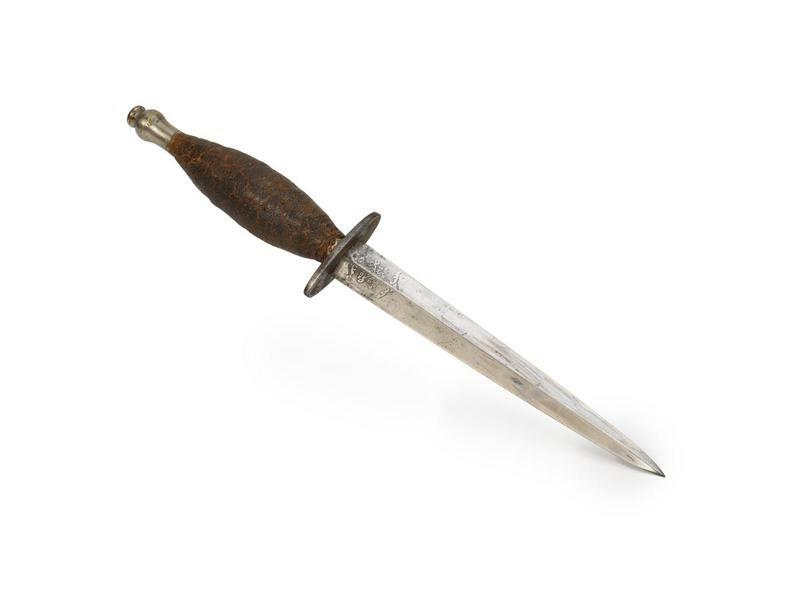 Auxiliary Unit issue Fairbairn-Sykes Fighting Knife [2nd Pattern], modified, with scabbard; image courtesy of Imperial War Museum. Military Area east of Woodingdean; Base image from East Sussex Record Office, The Keep. About three weeks after the birth of Peggy in Newmarket Farm, the military gave those who lived and worked in Balsdean Farm just two weeks notice to leave, sometime in the middle of May 1942. They wished to use the relatively open downland both as a training area and so they could have room for defensive manoeuvres should the Germans invade anywhere along this stretch of coast. Interestingly, the track leading up to Newmarket Farm was just outside of the Military Area. This would help with the family story that they didn’t leave Newmarket till October that year. Apparently an officer, either Home Guard or Canadian, was billeted with the Latham family after their father had signed up as a mechanic with the RAF in North Africa sometime before August 1941. The army had been remembered as training on the South Downs east of Woodingdean as early as 1937 by Bob Phipps. Wild West Balsdean cattle roundup in Lewes; Sussex Express, 18th May 1942. The Woodman’s found a farm in the west country to move to, but had to leave much of their furniture and other possessions behind. Dalgety, with help from the army as well as members of the Southdown Hunt, drove the farm’s cattle over the downs to Lewes where they were loaded onto a train to a farm in Yorkshire. The Lathams had to leave their mother’s piano behind. Tanks move into Balsdean. Photo: Holland – Mercer Collection. Tanks move into Balsdean – detail of photo. Photo: Holland – Mercer Collection. Local history recounts that it was mostly Canadian’s who trained in Balsdean prior to the tragic Dieppe Raid on 19th August 1942, which departed from the nearby port of Newhaven. Of the 4,963 Canadians that departed for France, only 2,210 returned, and many of these were severely wounded. This was a casualty rate as bad if not worse than just about any other battle during either the first or the second world wars. Balsdean shell craters. Background RAF aerial photo from 1945. East Sussex Record Office, The Keep. 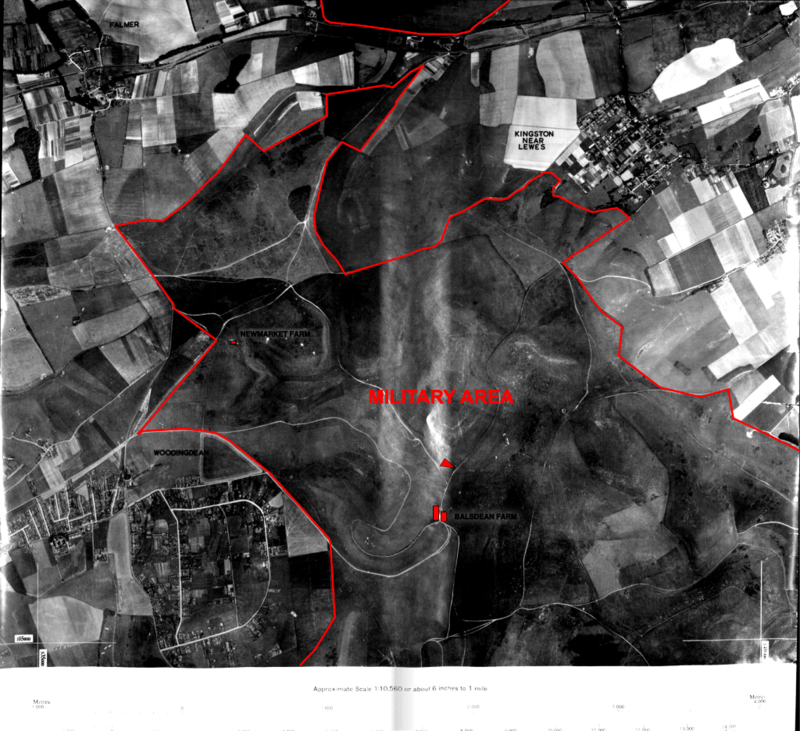 I highlighted most of the larger shell craters and associated WW2 features in this aerial photo to help show the extent of some of the training in this area. Just outside of this photo (taken by the RAF shortly after the war), to the north west, was the demolished remains of Newmarket Farm and three large German bomb craters on a nearby hillside. These were considerably larger than the artillery shell craters shown in this image. The many mortar craters which would have also existed across this area, many of which can be seen in a photo of the hillside to the east of Balsdean Farm given towards the end of my talk, are too small to be seen in this image. 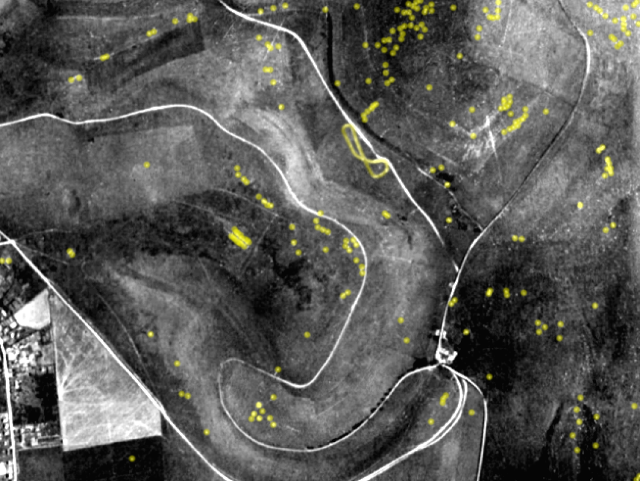 The double line of yellow dots, centre left, is evidence for one of the many anti-landing defences laid across the relatively flat hilltops in this area. The figure-of-eight shaped feature was a narrow gauge railway which was probably used to tow a target for anti-tank weapons training. The last image is of Balsdean towards the end of the war. Shattered remains of Balsdean Farm at the end of the war, showing mortar and shell craters on hillside. Photo: Holland – Mercer Collection. Balsdean Farm was the last survivor of a medieval deserted village. The remnants shown here are from the very end of the war. They show a picture of utter and complete destruction. Of the beautiful Queen Anne style Balsdean Manor house, only low stumps of wall remains to be seen in the front centre of this photograph. A thousand years of history had been swept away in just a very few short years. A plaque has now been set in the grass over the site of the altar of the former Norman Chapel. By the time of the war it was used as a cattle shed, but services were still held there at Easter by the vicar of Rottingdean. My father and most of the other children who lived in the nearby village of Woodingdean had a wonderful war – the only injuries being self inflicted accidents from illegally collected ordnance from the military training area, much of which was still live. Fortunately all survived, with the exception of an unfortunate donkey killed by a German bomb. 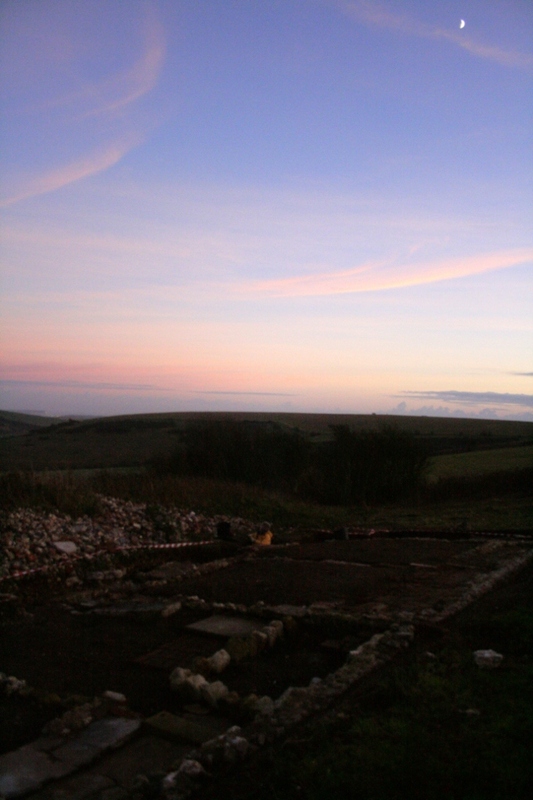 Looking SE at Newmarket Farm dig site at sunset. All good talks should end with a sunset and a happy ending! In 2013 my mother and I were fortunate to be given permission to excavate the demolished remains of the cottage where she was born. It was a beautiful place. Full of memories. So interesting. Three generations of my mother’s family were at Norton farm Balsdean in the late 1800’s. Name of Townsend. My Grandfather was born there. His father was a Shepherd. Went over to see the valley last year for the first time, so beautiful! I have a photograph of them sitting on a horse and cart. Hi David. Yes I live at Mile Oak, Portslade. Would love to meet up. There are three men on the cart. I assume one would be the farmer and the other two farm workers, one of which is my Grandfather. I do go over to Woodingdean quite often as my parents are buried there.